I prefer visitation hours to be 10:00am to 12:00pm if possible. This allows the dogs to have a quiet time and also allows me to properly care for your dog without interruption. After-hours arrangements can be made with notification. From Kamloops, take Hwy 5 North to Edmonton Jasper, at third set of lights turn right at Husky Station. 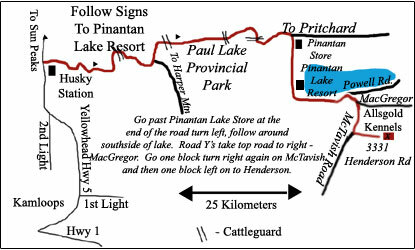 Follow signs to Pinantan http://premier-pharmacy.com Lake Resort (25 km), turn right off the main road when sign (Pinantan Lake Resort) indicates, you will see the lake and a store on left, follow to the end of the road, turn left and follow southside of lake for about 2 km. When road splits take the top road to your right (MacGregor), go one block and turn right on McTavish, and one block turn left on Henderson.